It all started when I refinished our mantle. I discovered a love of finding out what is beneath the natural weathering of wood. From there I started filling the house with accent walls made from barn wood from my grandpa’s place. Eventually, my husband said “that’s enough!”, It sounded like “help!” to me. 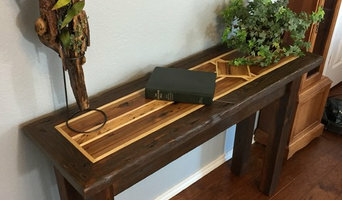 We started WalkingWood Creations so that I would have an outlet for my obsession. Both my husband and I now work full time creating and building furniture and home decor from a variety of reclaimed woods. 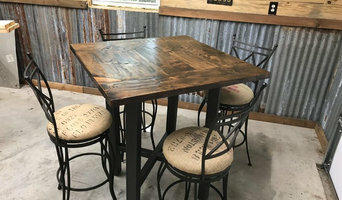 Little Wooden Penguin is a boutique custom furniture design firm in North Texas that believes in bringing the most beautiful, versatile, handcrafted furniture to their customers. We believe that everyone should surround themselves with pieces that represent them, pieces that have a story behind it and that they have a preference about. Pieces that they chose to own for themselves and pass on to their children. Our clients will never forget designing their own custom farmhouse table with their new spouse, or in preparation for their child's first birthday. We offer our clients something of true value that is going to last a lifetime and is artful and beautiful to look at. Lori Rourk Interiors is a full service Interior Design firm in Dallas. With over 25 years of experience specializing in residential and commercial design, Lori is able to capture the true spirit of your home or business through design. Lori is also a member of American Society of Interior Designers and has designed spaces throughout the Southeast as well as the greater Dallas Fort Worth area and Atlanta. Lori has been featured as the designer for the Food Network for the show called Food Court Wars. She has also been published in two books and on the cover of six magazines. Winner of 2018-2019 Best of Houzz Service. Certified Master Builder FC Builders has over 10 years of experience in the construction business, we pride ourselves on custom and unique builds with personalized customer service. We are family owned and operated out of Jacksboro, Texas. Aside from building custom homes we also have experience in commercial construction, remodels, additions and swimming pools. At FC Builders, the job is completely tailored to your specifications and you can count on dependable and genuine hometown service. Our desire is to assist you in making your vision a reality. Jake prides the business on superior workmanship and high quality materials. He chooses top-rated materials to ensure that each home is durable and energy efficient. "The key factor that sets us apart from other builders is our highly personalized service and individual attention. We build personal relationships with our clients and we really get to know them, this allows us to successfully lead them in the right direction during the building process." 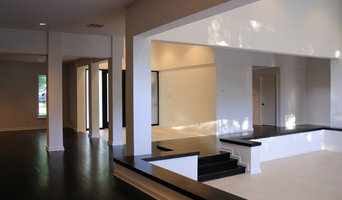 - Jake "Building the home of your dreams should be an enthusiastic and gratifying experience. We would be privileged to take this journey with you, so sit back, relax and enjoy the opportunity to create a home that is uniquely yours; we’ll do the hard work." -Crystal Let us know how we can help, give us a call today! Award winning design firm offering services in New Construction, Renovation and Decoration. Known for her nurturing, collaborative spirit and gracious manner, Kathy Rollins, Allied ASID creates timeless, inviting interiors that are not only beautiful, but functional and comfortable. She has been awarded Best of Houzz five years in a row: (2014, 2015, 2016, 2017 and 2018). Kathy specializes in designing interiors for busy professionals and active families. Her approach to design focuses on the melding of her client's tastes and lifestyle with classic design principles which results in authentic, meaningful interiors that truly reflect their style and personality. In addition to being a graduate of a nationally accredited program studying Interior Decoration and Design, Kathy also holds a bachelor’s degree in Industrial Engineering. She holds active memberships in both the American Society of Interior Designers and the National Kitchen and Bath Association. Comprehensive project management and budget adherence are top priorities to Kathy, and her process-oriented design method ensures no details are overlooked. Her resourceful, creative design skills paired with the application of streamlined business practices facilitate a stress free design experience while saving her clients time and money. She is known to strategically layer pattern, color and textiles in with her client’s own cherished pieces, creating interiors that are at once gracious and inspired. Kathy has a keen ability to help clients feel at ease with the interior design and construction process, working alongside them as their advocate from project concept to completion. As a result, many of her clients are ones she has worked with for years, over numerous projects. Her success stems from meticulous attention to detail, highly personalized service and her intrinsic ability to creatively interpret her client’s vision for their home. Kathy’s Design Philosophy: * Interior design is a joyful, creative, and rewarding process. * A well designed home is not only beautiful, but functional, comfortable and livable. * Great design happens within all budgets. * The key to a successful project is clear, frequent communication, creative collaboration and meticulous attention to detail. McCabe’s Theater & Living is owned and operated by Erin McCabe. Erin has an extensive background in the furniture industry that dates back to her childhood days of which she would occasionally spend running around her grandfather's furniture store, McCabe’s Furniture Fair in Little Rock, AR. Her grandfather, Fred McCabe, started his furniture business around the age of 40 years old and had great success as a business owner. McCabe’s became a household name in the furniture industry and was known as the “go-to” furniture store for customers in Little Rock. Erin’s father, Tony, also owned and operated McCabe’s Leather Showroom in Little Rock until he decided to make a move to Dallas where he continued to do business in the furniture industry. Erin worked for her father’s e-commerce website for several years and specialized in HTML website design as well as sales. 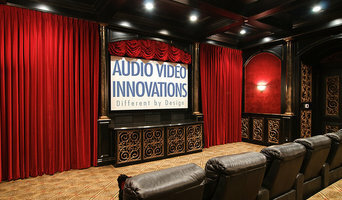 Her father's e-commerce company was the largest seller of home theater chairs in the country so Erin knows a thing or two about theater chairs and what the customer wants for their media room. After graduating from Texas Woman’s University in 2010 with a BA of Science, Erin decided she wanted to become a small business owner and began her brainstorming for what would soon become McCabe’s Theater & Living. At Sunfish Pools we are committed to providing our clients the highest quality pools for the best available price. On time and in budget, we are with you throughout the entire process. The process begins by capturing our clients’ vision of their dream pool and displaying it through distinctive 3-D software. This allows the clients’ to see and approve the entire outdoor space before construction begins. Once construction begins, you can be sure that our on-site supervision is unrivaled. With so many energy efficient and luxury features available today, we strive to make the pool building process enjoyable for you and your family. Reach out to multiple professionals — especially for larger projects — and don't settle for the first bid you hear. Comparing multiple Leon, OK professionals' bids and experiences can help you find the one that’s best for you. Ask a lot of questions now, so you won't have unexpected answers later. Find a home design professional: Narrow down your search by type of professional and location. Browse Leon, OK portfolio photos, read client reviews and contact each Leon, OK professional for more information. Check out the information in the specialised professional sections too for tips on how to hire the right professional in Leon for your project.